First, a good start, but you might want to make the boars larger, to better fill the available space. likely a cadency mark, given it's location and size. There just isn't sufficient space above the point of the chevron for a non-cadency crescent. If you were to move the crescent to the base (below the chevron) and enlarge it to fill the available space, it would look like a normal charge rather than a mark of cadency. A competent artist could make this better. If the chevron was more acute it would give more room for larger boars but here the crescent can't be mistaken for a mark of cadency. Please note that no check has been made to see if this design clashes with any existing one. My guess (only that) is that while you may find something similar, the chevron countetchanged likely will be different - but I could well be wrong! Last edited by Michael F. McCartney on Sat Dec 09, 2017 6:18 pm, edited 1 time in total. Also, could you share a bit of basic info re: your friend? e.g. surname or roots, a bit of his family history, etc.? Not looking to highjack your design process, just maybe make better informed suggestions. Here is a quick image I devised. 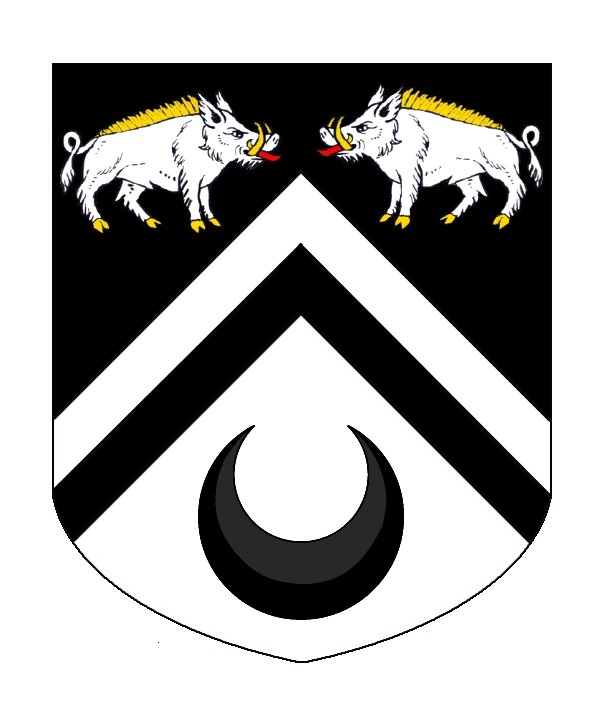 Brian - your anonymous friend now has two similar but not identical designs (versions,) to consider - the only heraldically significant difference being Martin's boars rampant vs Mark's boars statant. Before he decides on one or the other, you might suggest a "refrigerator test" for a few weeks (if you're not familiar with the term, just ask; I don't remember if it came up when you were designing your own arms). Of the two I kind of like Marks boars statant. Suggest he do the refrigerator test first! - before pasting bookplates in his favorite books!!! One nice advantage of Argent and Sable is that a black and white image is already in full color! Ha Ha - nice observation.